that risk still lie ahead. Flood attacked no less than 400 houses in Bar'kwari people group in Dawakin Kudu Local Government Area of Kano State on Sunday evening. The representative for Kano State Fire Service, Saidu Mohammed, made this exposure in a meeting with NAN on Monday in Kano. He said the flood also affected primary schools, animals and foodstuffs, adding that firemen were, however, able to rescue the victims. “We received a distress call from Hajia Gambo Usman, who lives in the neighbourhood at about 3:22 p.m., reporting that there was flooding in their area . “On receiving the information, we quickly sent our rescue team and a vehicle to the scene at about 3:38 p.m.,’’ he said. The official, who said that the flood washed away 400 houses, foodstuffs, animals and schools, added that firemen assisted them by creating way for the water to pass, so as not to affect other houses. Mohammed, however, urged the public to desist from indiscriminate dumping of refuse in order to stop blocking the waterways. He reminded the community of the Nigerian Meteorological Agency’s (NiMET) warning of downpour this year. Mr Al’Amin Yakubu, Head, Emergency Response Team of the community disclosed this to NAN on Monday in Jos. Efforts to reach Alhaji Alhassan Barde, SEMA Executive Director, proved abortive, but a senior employee of the agency who preferred anonymity confirmed the incident to NAN. 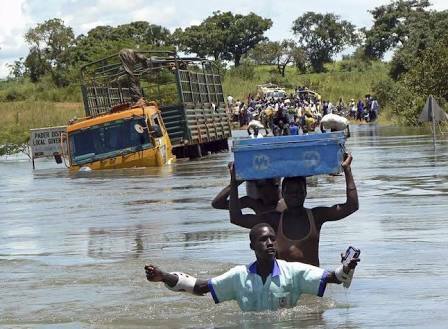 Several Delta communities have started experiencing flooding with the River Niger gradually overflowing its banks. Many farming communities have been worst hit with floods taking over farming communities situated on the banks of the River Niger and the hinterland. When The Nation visited the banks of River Niger in Oto-ogu, Oshimili South, the water level was high. Similarly, in Ughwru- Ughelli, Agbarho community, Ughelli North has started counting their losses following ravaging floods. The floods, according to sources, wiped out poultry and fish ponds as well as farm lands. Some residents have relocated to higher grounds. A poultry farmer, Mr. James Igho lamented he lost that over 500 birds as a result of the rains. Another fish farmer, Victory Johnson, said her two ponds were submerged by the floods. They appealed to the Delta Government to come to their aid. The Bayelsa State government yesterday began setting up measures to counter flooding following a red alert by the Nigeria Hydrological Service Agency (NHSA) identifying the state as high risk. Bayelsa was among the nine states on the axis of River Niger and River Benue identified as flood-prone by the NHSA, which passed the warning to the National Emergency Management Agency (NEMA). But in a statement by the Commissioner for Information and Orientation, Daniel Iworiso-Markson and his Environment counterpart, Ebipatei Apaingolo, the set up emergency mobile telephone lines. The government said the emergency call lines would be open 24 hours, every day of the week. The statement urged Bayelsans to take advantage of the mobile numbers to report flood cases and also support government’s effort by keeping their immediate environment clean and open up drains within their vicinity. The statement added that monitoring teams would be set up soon to go round the state to monitor flood prone areas and also respond swiftly to any emergency situation. According to the statement, the government is partnering relevant stakeholders and experts including the State Emergency Management Agency (SEMA) to ensure that the situation if it occurs is put under control. Insisting that the there was no need to panic, the government maintained that the proactive measures were geared towards preventing any recurrence of the 2012 flood disaster in the state, “even though floods are natural disasters and inevitable”. The 2012 flood disaster was one of the biggest challenge of the Restoration Government but, it said Governor Seriake Dickson spared no effort to ensure that the state was not consumed by the disaster. The statement averred Dickson mandated the Ministry of Information and Orientation and that of Environment to carry out the task of coordinating sensitization and monitoring efforts to safeguard residents. The National Emergency Management Agency (NEMA) yesterday held an emergency meeting with the Kebbi State Emergency Management Agency (KSEMA) to gather data on flood victims in the state. Dr Onimode Bandele, Deputy Director, Research and Rescue Department of NEMA, said the agency would soon hold an emergency meeting with stakeholders affected by flooding in the state, to enable the agency to gather data on the victims. “The data we are looking for is the number of houses and farmlands destroyed, as well as the number of deaths recorded in the incidents across the state. Bandele also said that they were in Kebbi to commiserate with the Government and people of the state over the loss of lives recorded in the incidents. “Let me use this opportunity, on behalf of the Director-General (NEMA), Mr Mustapha Maihaja, to condole with the government of Kebbi and the families of victims who lost their lives in the flood disasters,’’ he said. He also apologised for the delay in donating relief materials to the victims, stressing that it was as a result of some restructuring in NEMA, which would enhance the agency’s operations. Bandele assured that NEMA has been repositioned to enable it to effectively address its challenges. Alhaji Sani Dododo, the Chairman, Kebbi State Emergency Management Agency (KSEMA), commended the NEMA Director for the visit. Dododo said the disaster, which occurred in Danko, Wasagu and Fakai local government areas of the state, led to the deaths of 9 persons, including an Army Officer, who died while trying to rescue a woman following the collapse of a bridge. He said the Search and Rescue Department of the agency had been changed to Response and Recovery Department as part of the re-strategising process. The coordinator called on those living in the disaster-prone areas and other disaster-exposed persons to contact the agency for quick response and rescue in case of any eventuality.